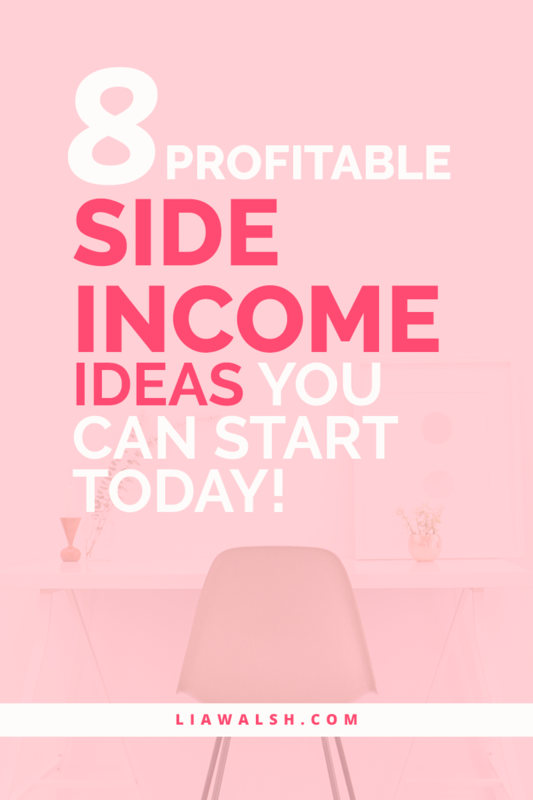 Whether you’re just trying to think of ways to make a little side cash or you want to launch a full-fledged business in the New Year, it can be so hard to think of profitable income ideas! 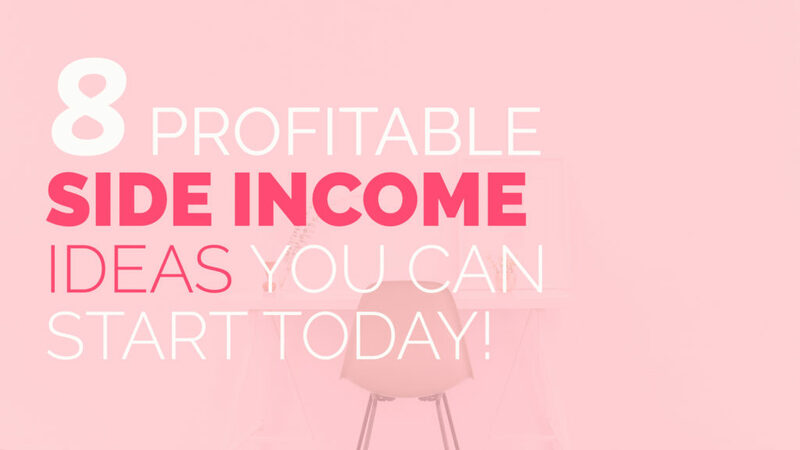 So if you’re not sure what the most profitable income sources are for someone with your skill set, check out the list of ideas below. There’s sure to be something that fits in with the abilities you already have, and that will let you make a little side income in no time! Before we get started: resources! Please note: for the sake of transparency, I want to say that some of the links in this article are affiliate links, and that means that if you decide to create an account or purchase something, I may make a modest commission from it. However, I want to be very clear that my top priority is your satisfaction and I would never recommend anything that I wouldn’t use myself. In fact, most of these recommendations are things that I do use myself every single day, whether or not they even have an affiliate program! If you’re fairly tech-savvy, I highly recommend a self-hosted WordPress website. (This article explains the difference between self-hosted and not, in case you’re not sure!) For hosting, I can’t recommend SiteGround enough, especially because their customer service is phenomenal. If you’re brand new at websites, I recommend Weebly because they have a drag-and-drop editor and the results are really professional-looking and easy to set up for e-commerce. If you need to register a domain name, I’ve personally been with Namecheap for over a decade and they’re great. If you’re planning to sell ecourses, you’re probably best off to host them on an online course platform. The one I recommend is Thinkific, because if you decide later on that you want to host them on your own website, it’s easy to integrate. If you go for self-hosted WordPress, the WooCommerce plugin is essential if you’re planning to sell things right on your website. It’s what I use for any kind of e-commerce I set up. For receiving payments in person, I use Square, which is free and very easy to set up. They will even send you an adapter for your smartphone so you can take payments in person. The Adobe Creative Cloud software suite is miles ahead of its competitors. Yes, it’s a significant investment, but it’s one that I’ve found worthwhile year after year. You can get just a single program, or you can get all of them for a discounted rate (which is what I do). If you’re starting any kind of service-based business like consulting or working hourly for clients, you can make your life a lot easier by using an automated booking tool. I’d recommend HoneyBook for this, because it will automatically sync with your calendar in real time. Pretty cool, right?! If you’re working with clients or doing anything where you need someone to pay you, the data tells us that accepting credit cards will boost sales. You can use FreshBooks to accept online payments and create professional-looking invoices super fast. And onto the 8 profitable income ideas! There are tons of folks who make money as a photographer! Partly, this is because it’s just so darn easy. Just snap some beautiful photos, upload them and promote them and you’ll see the sales coming in! Sounds pretty straightforward, no? If you’re not the world’s greatest photographer and you want some tips, there are tons of online photography courses (here’s a huge page of them just from Craftsy) that will teach you how to create stunning photos. To upload and sell your photos, you’ll just need a website of your own (see my recommendations above), or a platform like Creative Market, where you can create a merchant account. Most people know a ton about at least one subject. That could be anything from pet care to homesteading or even time management. If you know a ton about something, you can teach it! Consider creating an online course that you can then sell automatically while you’re offline, enjoying your life. Since online learning is so in-demand, this is one of the simplest and most profitable income ideas of all. To do this, you’ll need an online course system like Thinkific, which you can either host yourself or keep on their server. Tutors have existed forever, and coaching is just taking that idea and expanding to subjects that aren’t necessarily covered in school. If you’ve got an area you’re really knowledgable about and you don’t want to just make online courses, you can do one-on-one coaching either in-person or on the phone. The key with this income idea is to make sure that every client is getting a ton out of your sessions, and as long as that’s the case, you can make quite a bit of money doing this. You’ll need a website to be successful at this, as most people search online first for services. As per my recommendations above, my top suggestion is SiteGround for hosting your own WordPress website. In terms of booking, HoneyBook is really helpful, as per my recommendation above. For invoicing and processing online payments, FreshBooks is great and you can even get a free trial and make sure you like it first! If you’re good at writing, why not make some side income from it? Lots of blogs—especially company blogs—want content that’s ready to go, and that’s good news for you! If you know a lot about a common general niche, like food, fashion, business or even parenting, you can create content for other folks who want to use it for their website or blog. Consider trying out something like Constant Content at first, where you can write content on a specific topic and buyers can choose to purchase it. This way, you have something ready to make you passive income while you contact other services or companies directly for additional opportunities. To be a freelance writer/blogger, you’ll need a writing portfolio to show people. That doesn’t necessarily mean you need a website if you’re mostly publishing elsewhere, but it certainly helps. That being said, a tool like Grammarly is really important to use, so that you can make sure your writing is as high-quality as possible and easier to market. I’ve worked as a professional editor for years, and Grammarly still catches things when I write! If you’re having trouble thinking of which niche you should write in, check out my step-by-step guide on how to find your niche. Whether you’re writing about travel or you dabble in dystopian fiction, there’s space for your e-book! The key part is to make sure that your book is engaging (especially if it’s fiction) and/or useful (if it’s non-fiction). To create your e-book, I’d recommend using Adobe InDesign to make a PDF. In terms of where to “house” the book once it’s created, you could either create an e-commerce store of your own (see above for recommendations) or become an Amazon merchant. Again, it’s best to use something like Grammarly if you’re going to be selling your written word. One of the most profitable income ideas, because it’s a bit off the beaten track, is becoming an affiliate storefront. Lots of vendors are interested in gaining exposure to your network, and so they offer affiliate programs. The largest of these is Amazon. Basically, you set up a storefront where you sell on behalf of one or more companies, who do the heavy lifting like creating the product and shipping it to the customer. This is a pretty straightforward and very automated process, and you can make quite a bit of money if you choose your products carefully and market them well! For this, you will definitely need to have a self-hosted e-commerce website. Check out the recommendations above for more detail, but I recommend SiteGround for hosting a WordPress site and Namecheap for domain registration, if you need somewhere to start. Virtual assistants are in huge demand right now because running an online business involves so many repetitive tasks and processes. As a small business owner, you’d much rather spend your time on the big-picture ideas than the minute details like posting to social media. If you’re reasonably tech-savvy, you could start your own virtual assistant (VA) business and make a lot of income! What you’d need for this is a website where you lay out what you offer and why clients should choose you. That’s about it! Then you promote it and watch the clients roll in. It’s definitely helpful to have a booking and invoicing software like HoneyBook to help with this, but if you’re a super organized person, you could probably make it work without it. If you’re a creative person, you could totally sell your designs on custom merch. (I’ve done it myself.) Redbubble is a great marketplace that people go to when they want to support independent artists. You get to choose how the products are priced (as in, how much of a commission you get on top of the cost for Redbubble to produce it), and they have a ton of products you can put your design on. The best part? You just upload beautiful art and customize it, and Redbubble does the rest. Redbubble isn’t the most profitable income idea unless you take the time to actually publicize your designs, though. So be prepared to put a little bit of effort into networking, promoting on social media and so on. To make designs for Redbubble, you’ll need graphics editing software like Photoshop or Illustrator (which is what I use). I hope these profitable income ideas turn out to be…well, profitable for you! Be sure to keep in mind that even the simplest businesses require some effort, and you really will get out of it only so much as you put in. If you’re creating content, make sure it’s amazing content! If you’re working with clients, make sure they get a ton out of the time they pay you for! It’s all about making sure that you’re super great at what you do, so that people see that and become raving fans. Have you tried any of these income ideas? Were they super profitable for you? Let me know in the comments! These are some really great ideas for a side hustle! Thanks for sharing them and your Insight!